As with any industry, there are many questions surrounding mechanical insulation and its role in the overall performance of a facility. Along with questions about types, thickness, and function, there are misconceptions about mechanical insulation that lead people to question whether the investment is really worth it. In this article, we’ll clear up four common misconceptions about mechanical insulation and reveal the real answers to these frequently asked questions. Misconception #1: Mechanical insulation is only important for new construction. With an ever-increasing demand for sustainability in today’s construction market, saving energy through insulation is more prominently on the minds of building owners and designers than ever. But, contrary to popular belief, mechanical insulation is important for all facilities, not just new ones. The energy and cost-saving benefits associated with mechanical insulation are just as applicable to older facilities as they are to new ones—perhaps even more so, since the technology and advances in insulation are lightyears ahead of the old systems that many buildings still have. Misconception #2: Insulation is a good candidate for value engineering. “When a project comes in over budget, all mechanical trades being the process of reducing the cost of the building: a little less of this, a little less of that, a little less insulation on this system, remove the insulation from that system, and so on. Basically, value engineering doesn’t work for mechanical insulation. Insulation systems are specified and designed to achieve particular results, and installing anything less than the specifications is doing a disservice to the entire system. The true best way to save money when it comes to mechanical insulation is to install a system that reduces energy consumption and emissions as much as possible, with whatever insulation thickness and materials are required. Misconception #3: Insulation is too expensive of an investment. Installing the proper mechanical insulation is an investment—but, far from being too expensive, it’s an investment you can’t afford not to make. 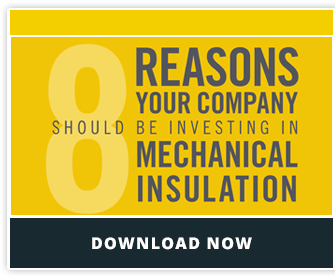 The ROI of mechanical insulation depends on the size of your facility and your standard operating conditions, but one study found that 82% of businesses saw a return on their investment in less than a year, and 15% saw a return in less than three years. According to the National Insulation Association, for a large or medium facility (from 26 Btu to over 500 Btu/year), the payback period is about 1 year on average. For small facilities (less than 26 Btu/year), the payback period is about 9.6 months. So, while the misconception is that mechanical insulation is too expensive to be at the top of the priority list, the truth is that it has one of the fastest payback periods of any energy-saving initiative. Misconception #4: Mechanical insulation is just for reducing energy loss. On the contrary, mechanical insulation has many other important functions beyond preventing energy loss. Insulation helps create a healthier workplace by decreasing occupational noise exposure, protecting workers from extreme temperatures, and providing firestopping qualities where pipe passes through a wall. In addition to these functions that contribute to personnel protection, industrial pipe insulation is one of the most powerful tools available for controlling indoor mold growth in facilities. Because it’s designed to control temperature and moisture, mechanical insulation creates dry, temperature-controlled conditions that inhibit mold growth.